So I have mixed feelings about this dress. It’s the Sewaholic Harwood Dress that was released a few years ago, View A. 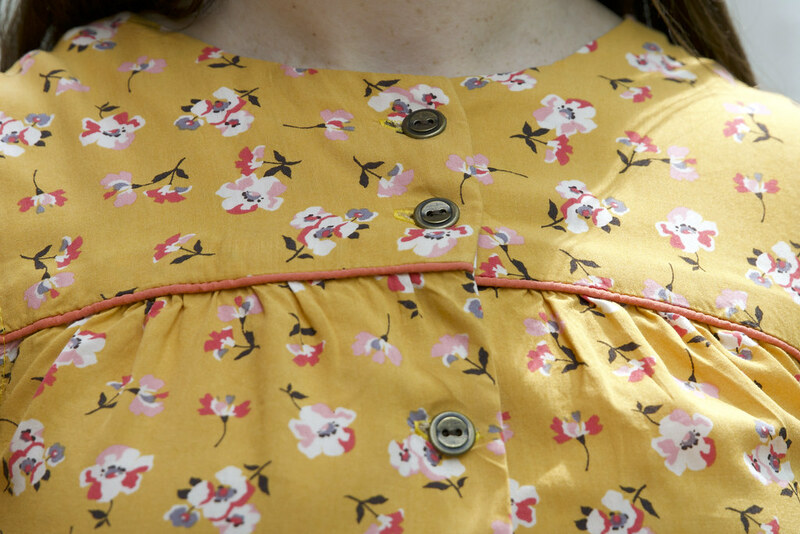 The fabric is a rayon from Joann and the orange piping comes from silk crepe scraps. The colors and flowers feel a little 1930s/40s to me and combined with this style it has a kind of vague 40’s housedress feel. But that’s not my issue, I actually really like the print. But the fabric, combined with the pattern design caused some construction issues. Even though I starched the heck out of this rayon, it was still difficult to cut the center front on the straight of grain. I think it’s a little wobbly. Even though I did that wonky FBA, the front gathered bodice sections still need more width – like at least an inch on either side in the front. That, combined with the fact that the elastic does not extend entirely around the front of the dress, means there is constant strain on the buttons causing gaping in front. I had to sew in three sets of hidden snaps. One below the waistline button and one on either side of the button just below the yoke. I also had to move the button just below the yoke further to the edge to lessen the straining across the bust. Style-wise, I don’t love the slightly wide shoulder line. If the shoulders extended out any further they’d be cap sleeves. 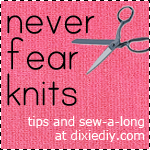 I definitely would prefer it if the fabric ended at my shoulder point or further in. They’re just at a weird location and I think they make my shoulders seem wider than they ought to be. It’s just… odd looking. On the plus side, the dress looks is a lot cuter in these pictures than how I felt wearing it in real life. This dress is growing on me but I doubt I’ll sew it again. If I want this type of style (sleeveless, button front, gathered waist), there are similar patterns that I’d rather make. Previous Article← Silk Willow Tank + NEWSLETTER!